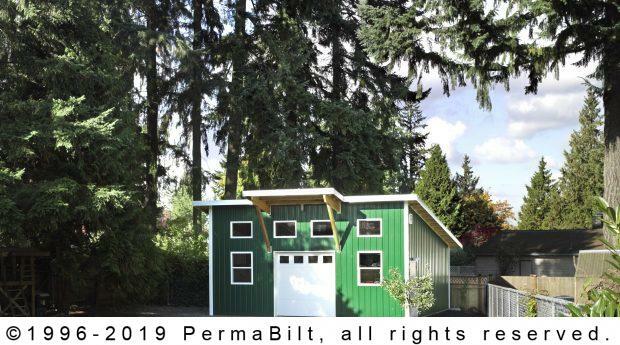 A Redmond resident walked into our PermaBilt® office in Lynnwood and asked if we could build a specific steel garage design he had in mind. Initially a person rarely has a specific design in mind when first contemplating having a garage built. This surprise d us somewhat. However in short fashion we learned this gentleman was an architect and we were pleased he was. The design he had in mind was a steel garage with a portico. This portico, which was over the garage entrance, was our first time using this unique style of construction. Since this garage was built, we have used the portico design feature in many buildings (being fortunate to show prospective customers this photo doesn’t hurt!) Glu-lam beams extended the width of the roof plus 4’ beyond for the portico. Decorative support beams were trimmed with cedar. The result was a nice look and a unique change from most traditional garage s.
By adding in a raised panel steel overhead garage door with Stockbridge lites, 18” eave and gable overhangs and square white gable vents, our customer added some nice accessories to his buildings. And each window was Low E (or Low-emissive), meaning that the window glass had a surface that reflected heat while allowing maximum light to pass through. This helped reduce energy consumption and increased the overall comfort of his garage. Bottom line was that our architect client wanted something unique, functional and durable and that’s exactly what he got.